This is one of Gershwin's loveliest songs, the music no doubt inspired by the charming lyrics of the composer's brother Ira. The treatment here, for string octet (Mendelssohn combination) or string orchestra, is quite elaborate and the textures quite rich, but the arranger has tried to keep the direct and touching expression of the original (words and music) in mind. If a double bass were added to the string octet in a chamber performance that would be all to the good, but it's not essential. 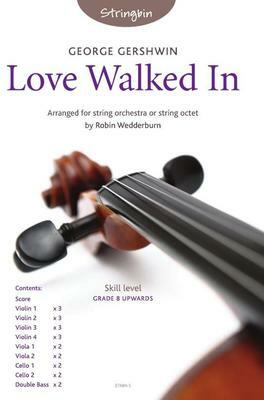 What do you want to know about Love Walked In by Gershwin, for string ensemble?